First of all, creating a meme is not as easy as it may sound at the beginning. That is something I realized pretty quick while thinking about different ideas. I believe the main challenge is, that you have to think about a meme that depicts something that a huge audience can relate to. As soon as you think about something that just a specific audience, like your friends or fellow students can relate to, it is pretty obvious that you will not get that much of engagement. So, I moved on from some ideas that maybe just Newhouse students could relate to, to something more general that every student would understand. During the developing process, I thought about myself and what kind of issues or problems I am facing right now. 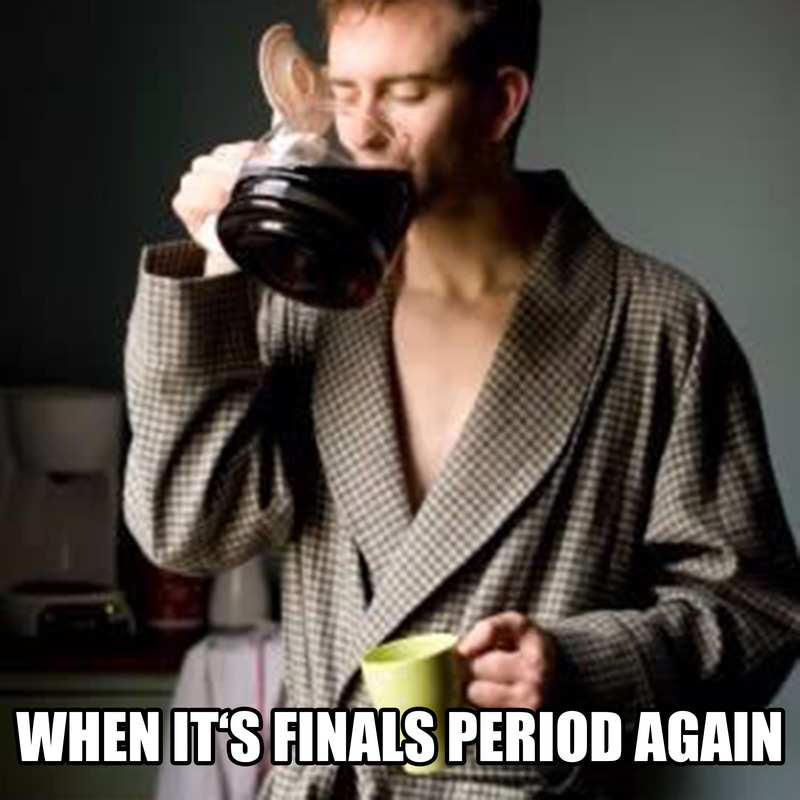 Since finals are approaching, I wanted to create a meme that deals with something, students do during their finals period. I took a closer look at what students do while learning in the library and realized that everybody had a cup of coffee next to their laptops. So, I finally came up with the idea of showing how the coffee consume of students increases in the last weeks of the semester. I wanted to give the campaign a unique name, which is why I used a unique hashtag #nocoffeenofinals. -total views were at about 950 on Monday 12:00pm when the campaign ended and is at about 975 at the moment when this blog post is published. I planned to do 4 promoting Tweets during the campaign. I wanted to use a variety of different tweets and make use of different opportunities Twitter offers to create a tweet, e.g. a moment. I also wanted to use rich media like a gif to make the tweets more engaging. In addition to that, I scheduled one tweet that would mention a profile related to the topic, Starbucks, and was hoping for a retweet. I decided to add a gif to that tweet as well. The first tweet of the campaign was the web card. I cropped the preview of the meme, so that the user would not see the whole meme before clicking the link to increase views on Imgur. -the twitter web card, the first tweet of the campaign. For the scheduling of the tweets I chose the 2 times when my followers are most active, based on Follower Wonk. I used Tweetdeck for the scheduling. I could achieve a total of 950 views on Imgur. It was interesting to see, that I could achieve my goal of a minimum of 500 Impressions on Imgur before even starting the Twitter Ad campaign. I already had around 650 views on Imgur when I started the campaign. Additionally, I got some engagement on Imgur as well. I could achieve a rating of +5 out of 11 total ratings (8 up votes, 3 down votes). The meme was also commented once. As I just said, all of that happened before the Twitter Ad Campaign was even started. It was very interesting to see how powerful the Imgur community itself is. Unfortunately, I could not achieve any of my objectives regarding Retweets, Likes, Comments or Mentions on Twitter. An explanation I can think of is the use of the Twitter web card. Some people were actually clicking on the link to the meme, but after seeing the meme would probably not go back to Twitter and like or leave a comment. I think if I had just posted the meme on Twitter without using the link to Imgur, the engagement might have been higher. This assumption is also supported by the fact that the second tweet of the campaign, which used a gif, got the highest engagement rate of 10,4% of all tweets within the campaign. The 10,4% are just based on organic results, since this tweet was not promoted. In general, much of the engagement I got on Twitter was organic and not due to the sponsoring with Twitter Ads. -the tweet with the highest engagement rate of all 4. Regarding the impressions, the campaign was pretty successful. I could gain a total of 3.512 Impressions, from which 2.019 were promoted. All 4 tweets count a total of 51 engagements, of which 19 were promoted. Although the engagement rate was pretty low and could not be increased in comparison to earlier tweets, it was interesting to see that I had a better engagement rate when just analyzing the organic engagements. I could gain my objective of getting 2 new followers. It is difficult to say if I got those 2 new followers because of the viral campaign, since I also published a couple of other tweets at the time when the campaign was active and got some engagement on those as well. I split my total ad budget of $5 into $4 on the web card tweet and wanted to keep the remaining budget for the moment I was tweeting to summarize the campaign at the end. For the tweet I promoted with $4, I did not narrow the audience at all, trying to target as many users as possible. Since I wanted to experiment with that, I narrowed down the audience for the promotion of the moment. I did this based on statistics of the first promoted tweet. I chose an audience with an age range from 13-34 and also added some related keywords like #coffee and #student as well as “Starbucks”. It was interesting to see that the cost per thousand impressions were lower in comparison to the tweet without a specific audience. I was actually hoping that my unique hashtag would have been used a couple of times by other ones who see the tweets. Unfortunately, it was not according to Twitter. At the end of the campaign I was asking myself if it actually was successful or not. Based on the results on Twitter it was not, but I think it was based on the results on Imgur. Maybe it is the combination of those 2 platforms that made the results on Twitter that bad. It would be interesting to see how the results would change, if the campaign was done again but just with the use of Twitter. I have the feeling that as soon as people click on the URL on the web card, they are more unlikely to go back to Twitter and engage with the tweet. Instead, if you can do everything within one platform, it is just more convenient and makes engaging much faster and easier. When comparing the impressions on Twitter with impressions on Imgur, it is also obvious that not everybody who saw the web card, was also clicking on the link and therefore seeing the whole meme. So, using just Twitter would have led to the fact, that more people had actually seen the meme.